Dare to Bet on Elections? Then Do It Like a Champ! Betting on sports is fans’ favorite worldwide. Similar goes for the obsession with online gambling modes such as- casinos, card games or lottery. But have you ever thought that you can bet on the coming presidential election in your own country (or a neighboring country) in 2016? Well, political betting had always been popular, but it was only limited to a niche area. With the upcoming US election, phrases like ‘bookmaker’s election odds’ and ‘wager’ are quite hot in the online gambling industry. Ladbrokes, Bet365 are some of the cool websites that can provide you with excellent platforms for online political betting. Whether you want to earn some quick bucks or relish the international political hullabaloo, political gambling will definitely be a memorable experience for your persuasion. Which is the best part? Not only you can bet on your favorite political leader, but also result in any ongoing political debate/ election around the world. Remember Brexit? If you are a rookie gambler, then understand the difference between sports betting and political betting. Did you know that online political betting is banned under US jurisdiction? To make an informed choice, the following points will definitely give you heads up. Researching thoroughly on your favorite candidate and his/her rival is the first step. But here is a catch- the more risk you take on choosing your candidate, the more will be the amount of payout. In the upcoming US election, Donald Trump and Hillary Clinton are two hottest of the candidates, so it’s expected that bookmaker’s election odds will be in their favor. Here, if you are willing to put your stake on nominees like Gary Johnson or Jill Stein, your will receive a greater payout if any of them wins. Tricky, isn’t it? That’s why it’s all the more important to grasp the political scenario. You should also keep it in mind that, sudden deaths, retraction of nomination, as well as scandals, can hamper the outcome of your bet to a great extent. The internet is a good place to start with, to enhance your repertoire of knowledge regarding election climate of your nation. How about downloading some sportsbook accounts from betting sites and going through them? There are communities in the virtual medium formed by gamblers as well as bookmakers, where you can post your query and get replied too. Lastly, you must be prepared to listen to news channel/radio and going through the political segment of dailies on a regular basis. A prediction market, Future trading, etc. are the words that sound strange to you? If yes, then this is not your fault. Because a unique trend is taking place in the USA right now, which is, betting via prediction market? As political betting is prohibited in the USA, the political enthusiasts and gamblers alike are inclining towards future trading to know more about bookmaker’s election odds. Now, what is future trading you can ask? It’s practice in the world of finance where traders put wager depending upon the probable outcome of a political/economic event. Or in other words, it’s all about trading shares depending upon the answer - ‘yes’ or ‘no’. If you are not in the line of a traditional gambler and looking for ways to bet in a more intellectually stimulating way, then Predict It is the one-stop destination for you. 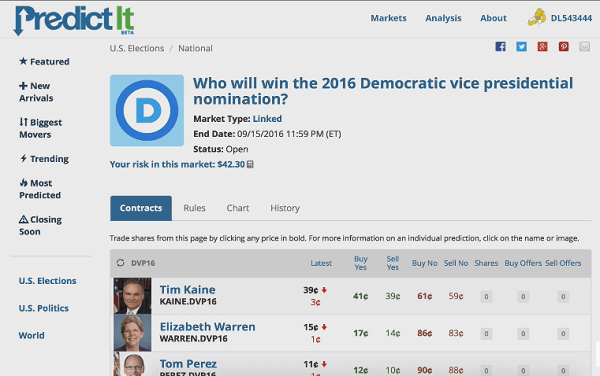 This is right now the most popular site in the center of a prediction market. Do you Know the Types of Bets? There is limited scope in the political arena offers to the gamblers. Unlike Olympics, sports tournaments take place around the world throughout the year. For horse racing, it is literally being conducted every day. So, one has the more shots for winning the gamble in games. But politics is another beast altogether. You should be cautious regarding your affordability to bet on the presidential election that occurs in every 5-long years. If you are a new entrant in online political gambling, then sticking to the safe ‘Straight up bet’ would be your best choice. What is the Reason? You can bet against a candidate with lower odds and milk away great money. Or you may put your stake on a favorite nominee with higher odds, and get the modest amount. The choice is yours. Another popular form of political betting is ‘Money Line Bets’. This is riskier. Here, you can gamble on the chances of the margin a candidate will win with. Or how many states he/she can take over eventually. Do you know that in USA presidential election in 2010, it was gambled that Barrack Obama would win over at least 50% of American states? Now this was clear case of classic Money Line Bet. Choosing the right site for putting your stake is the ultimate decision you should make. A quick Google search will land you up at pages of affiliated marketers advertising top-notch site names for online gambling. You can also visit some gambling blogs dedicated to sports as well as political betting. From there, you can also find many leads. Do remember that a well-recommended site should be your first choice, as it guarantees transparency. Bonus and offers play a major role in determining the value of a good betting site. Some sites present sign-up bonus through selective affiliated channels. Other like GTBets presents a discount of 100% cash if you invest up to $250. A top-notch site like Ladbrokes provides you (the new entrant) with the option deposit bonus up to 100% if you open an account with a certain amount. But apart from bonus and offers, you should look out for safe banking options too. The stats and information carried out by a site is another indicator of its quality. Not only that, it should feature all the elections happening simultaneously or going to take place in its pages prominently. Political betting is still a long way to go in online gambling field. If you are a politically conscious citizen, searching some fun ways to earn moolah, then you can gamble online on elections anytime. If you are determined to win more here, does your homework right from the word go?